On a recent trip to my native Germany where I ate my way up and down the list of foods that I miss living in America, my mother and I made potato pockets with apples (Kartoffelmaultaschen). It is a very filling dessert. The first night we had it warm straight from the oven. The second night we ate it cold with a hot white wine sabayon, and the third night we warmed up the final leftovers and ate them with the chilled sauce. You would think that I would not want to eat those pockets for a while, but I found the potato dough so wonderfully light and tasty that I kept thinking how I could use it for a savory dish. In the back of my mind were also the loads of frozen spinach that need to go before the new harvest comes in. With the ground covered in snow in the last couple of days, it looks like I am not going to seed the new spinach very soon. 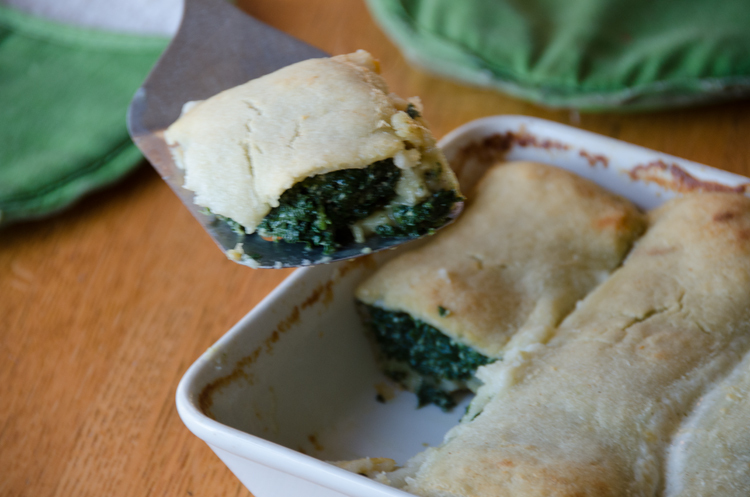 But I made the potato pockets with spinach anyway. Here is the recipe, which can be easily cut in half to feed four people. 1. For the dough, brush the potatoes clean and cook them whole in their skins in salted water until they are easily pierced with a knife, about 25 to 40 minutes depending on size. Drain and cool. 2. Remove the skins and pass the potatoes through a potato ricer into a large bowl. Add the beaten egg, salt and flour. Knead to a smooth dough. 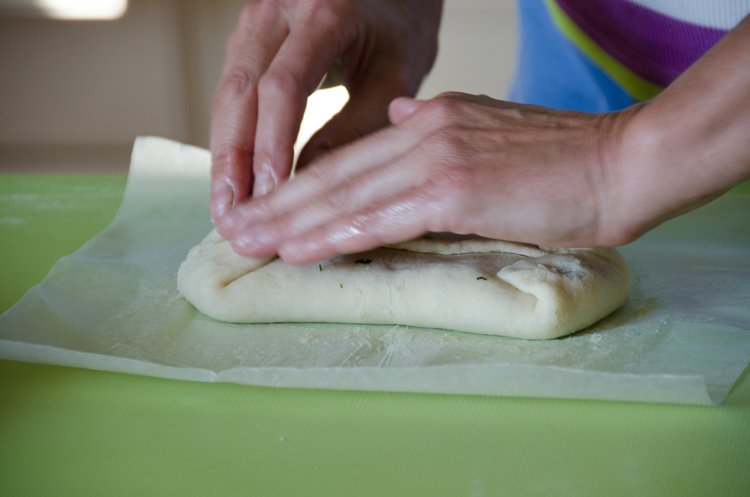 Set aside and cover so the dough won’t dry out. 3. For the filling, place the spinach in a large pot or skillet and cook uncovered until it wilts, turning often. Remove to a colander to drain. Chop finely. Squeeze out any excess liquid. The spinach does not have to be totally dry but it should not release a lot of liquid neither. 4. Beat the ricotta with a whisk until smooth. Stir in the egg and the melted butter. Add the cooled spinach and mix well. Season generously with salt, pepper and nutmeg. 6. 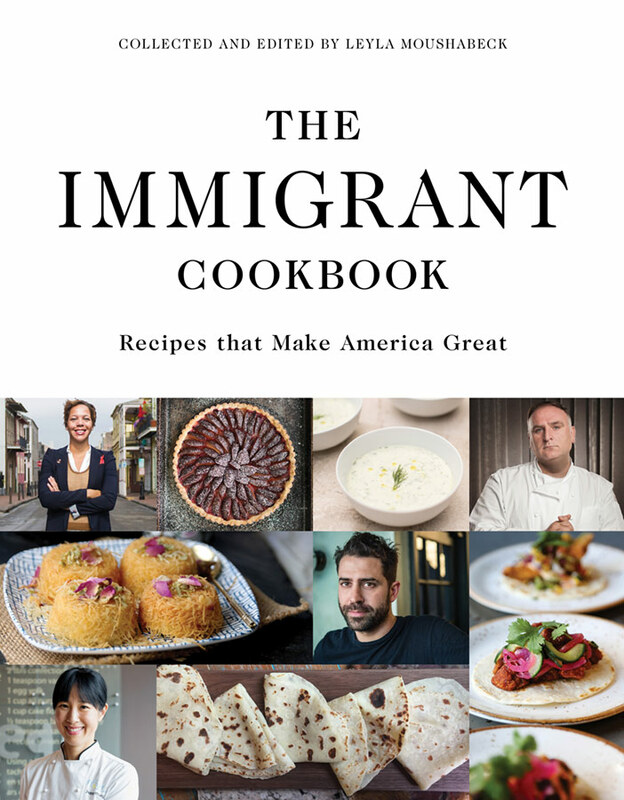 Preheat the oven to 350 degrees F (180 degrees C). Grease a lasagna dish, or a large rectangular gratin dish. 7. 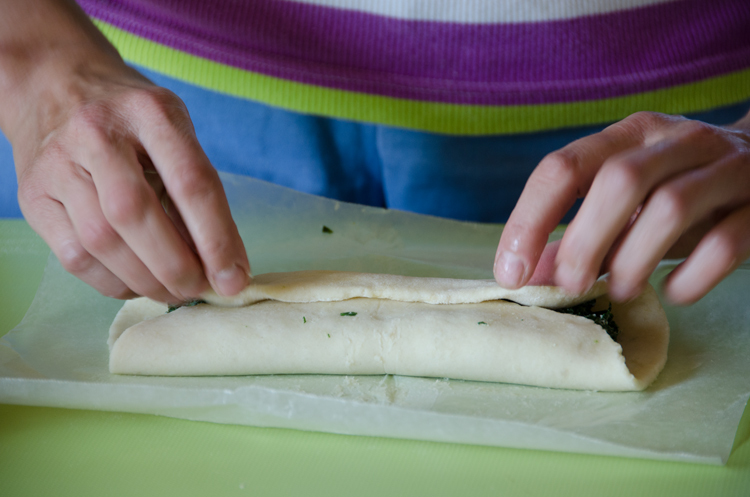 Divide the dough and the filling into 8 equal portions. 8. 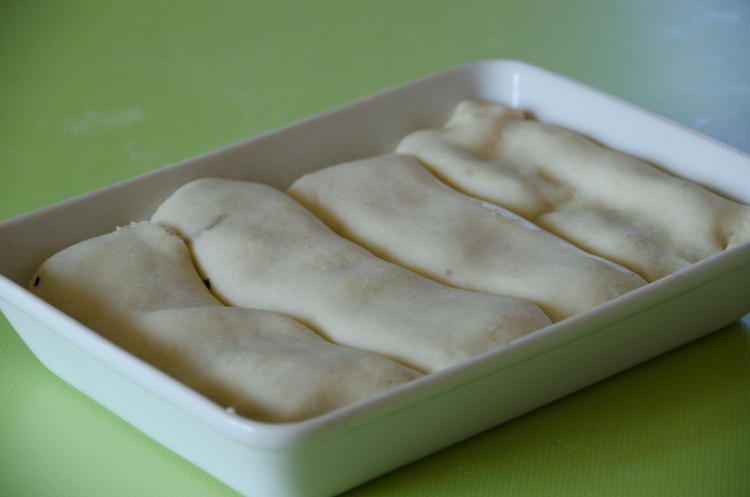 Cut a piece of wax paper or parchment paper and roll out a piece of dough to a rectangle, with a length that fits the width of the dish you are using, and about 4 to 5 inches (7.5 to 10 cm) wide. 9. Place the filling in a long mount in the middle. 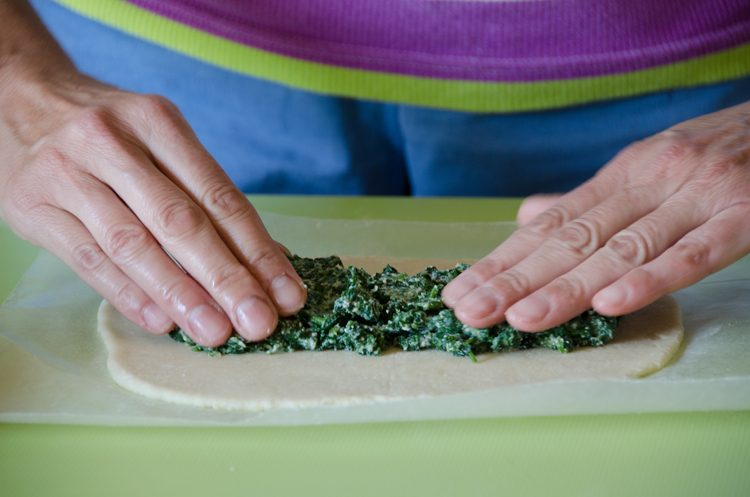 Fold the sides over (if the dough sticks to the wax paper, loosen it carefully with a dough scraper) and pinch to seal. 10. Place the pocket seam side down into the dish. 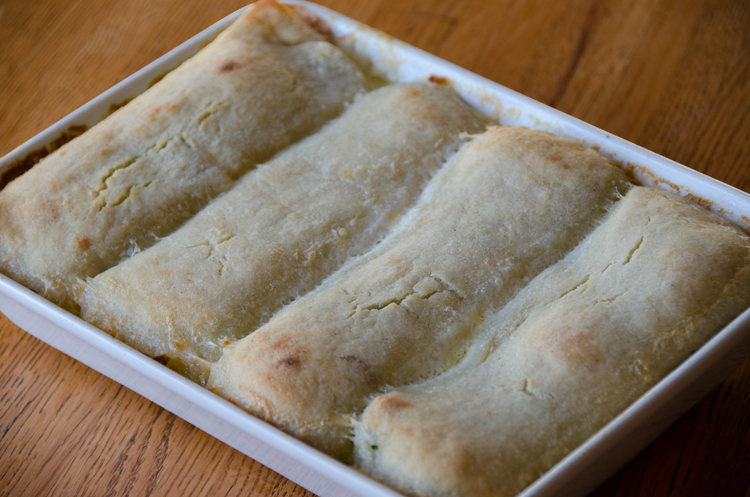 Proceed the same way with the eight other pockets, fitting them snugly into the dish. 11. For the topping brush the pockets with the melted butter and place the dish into the oven. Bake for 10 minutes, then pour the milk over them. 12. Bake for another 40 minutes, or until the pockets are golden on top. Let stand for 10 minutes before serving. Serve hot.